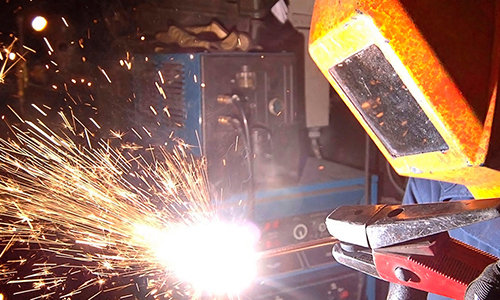 Welding is a career choice that is in high demand and is a skill that can take you all over the world. Welding is used in all types of manufacturing and more than 50% of all products manufactured in the U.S. require welding. Construction is also a huge market for welders. Buildings, bridges and power grids would be impossible without welding. The Welding Technology program at Calhoun prepares students with hands on application and welding theory as well as the nature of metals and types of gases used. The curriculum is designed to meet the minimum skill standards established by the American Welding Society (AWS) for entry-level welders. Specific training includes Flux-cored Arc Welding (FCAW); Gas Tungsten Arc Welding (GTAW); Gas Metal Arc Welding (GMAW); Shielded Metal Arc Welding (SMAW); and Plasma-arc cutting (PAC). Students also complete coursework in blueprint reading, welding inspecting, testing principles, and fabrication techniques. Calhoun’s program is approved by the National Center for Construction Education and Research (NCCER), under the sponsorship of the Alabama Department of Education, as an Accredited Training and Education Facility (ATEF) and is an AWS accredited testing facility. Entry-level welders are employed in a wide range of manufacturing, industry, and construction and have an excellent earning potential. The typical base salary ranges for entry level to experienced: Maintenance Welder – $30,770 – $56,000/yr., Pipe Welder – $35,344 – $102,888/yr., Structural Welder – $35,000 – $56,000/yr., Welding Inspector – $45,000 – $80,000/yr. These base salary ranges do not include overtime or benefits.